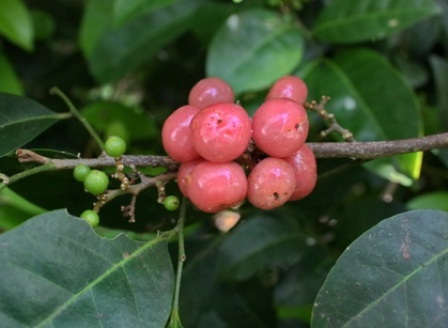 Pink lime berry is a fruit of Australian origin. It occurs in North East Queensland to Cape York Peninsula and southwards to coastal central and south-eastern Queensland and also in some parts of Western Australia at places ranging in altitude from near sea level to 550 m. Besides Australia, this fruit also occurs in some countries of South East Asia. This plant is grows in the drier rain forest types, monsoon forest, beach forest and vine thickets. An evergreen shrub, 2-4 m tall. Flowers: sepals about 0.5 mm long; petals about 4-5 mm long, glabrous or eventually becoming almost glabrous; stamens ten, dimorphic, five long alternating with the petals, five short opposite the petals; ovules pendulous, one per locule in the ovary. style thick and short, shorter than the ovary. Fruit globular or depressed globular, 10 to 12 mm wide, orange to pink at maturity, style and stigma persistent at the apex of the fruit. Seeds globular, about 6 to 8 mm wide, testa thin and transparent; surface of the cotyledons marked by numerous oil glands, cotyledons green, oil dots numerous, radicle and plumule clothed in rusty brown or white hairs. The small orange fruits of pink lime berry are sweet, juicy, honey flavoured with resinous overtones. These are eaten fresh. The fruits also make a delicious jam which has a characteristic taste of candied honey. The leaves are dried and ground into a powder that is used in the preparation of a wine-like beverage called ‘Kiu-tsee’, which is made from rice and soya beans. It is said to be impossible to obtain a good fermentation without these leaves. 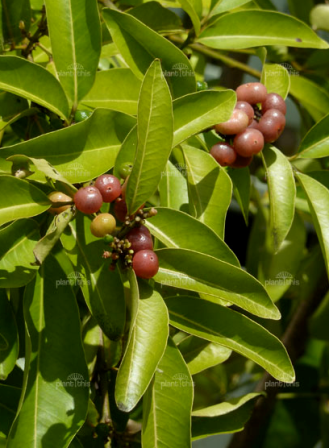 Pink lime berry is a very easy to grow plant. Though it can grow nearly everywhere but still it does especially well when planted at sunny locations. The plants come into bearing in 2-3 years and at most locations, the flowering and fruiting continues throughout the year.